VMware Horizon View allows IT organizations to deliver virtual or hosted desktops and applications through a single platform to users. The success of these virtual desktop deployments is linked to the user experience: virtual desktops have to deliver better performance than physical desktops. The heterogeneous, multi-tier, inter-dependent nature of the underlying infrastructure makes performance monitoring, diagnosis and reporting a challenge. When users complain that “the virtual desktop or application is slow”, IT administrators often struggle to determine the actual cause of the problem. Is it the network, database, application, virtualization platform, connection server, storage or the virtual desktop? This webinar will help you learn how to unlock the benefits of desktop and application virtualization by enabling your organization to monitor, diagnose and report on the performance of your VMware Horizon View infrastructure. In the multi-device workplace, there are many vendors IT can choose from to better manage applications and desktops. So, which vendors offer the best client computing solutions with a commitment to long-term end-user computing innovation? Find out how a variety of vendors compare and the reasons why VMware has moved into the Leaders category in the IDC MarketScape: Worldwide Virtual Client Computing Software 2015 Vendor Assessment. Which vendors offer the best client computing solutions with a commitment to long-term end-user computing innovation? Last year, VMware announced the launch of VMware Horizon® 6 with RDS and full support for remoted applications. This release supported end users with seamless access to all of their virtual desktops and applications—including RDS hosted apps, packaged apps with ThinApp®, SaaS apps, and even virtualized apps from Citrix—through a single unified workspace. Watch this on-demand webcast to see the six key enhancements to Horizon 6, including features that help you deliver unlimited access to desktops and apps at lower costs, with better performance (think 3D!) - at unprecedented scale, and new technology demonstrations that bring together virtual networking, storage, desktops and apps. Citrix XenApp and XenDesktop 7.6 are fast becoming the standard platforms for deploying application and desktop virtualization. Based on the new Flexcast Management Architecture (FMA), XenApp and XenDesktop 7.6 provides a unified platform that makes application and desktop delivery fast and easy. Join us for the Top Eight Best Practices for Deploying Citrix XenApp and XenDesktop 7.6 live webinar to learn how to take advantage of all the new Citrix features and enhancements to improve the security, manageability and remote access of your virtual applications and desktops. Peak performance and a positive user experience are the keys to the success of Citrix XenApp and XenDesktop deployments to virtualize your applications and desktops. When application slowness occurs - and users notice - productivity and business revenue can be negatively impacted. Watch this webinar to learn how to optimize your virtualized Citrix infrastructure for peak performance and end user satisfaction as the five most common performance problems and best practices are discussed. A growing number of companies are virtualizing Citrix XenApp and XenDesktop on VMware vSphere to reduce cost and boost flexibility. While Citrix virtualization seems like a straightforward project, some issues - like performance problems, delayed deployments, cost overruns and frustrated users - can occur. In this webinar, find out how to prevent these issues through discovering the top five challenges and best practices for virtualizing Citrix XenApp and XenDesktop environments on vSphere. Desktop computers have been in existence for over 30 years, but the innovation in the last 10 years has fundamentally transformed the way we use them. The desktop is now increasingly found in the cloud, thanks to the technological advancements leading to the Virtual Desktop Infrastructure (VDI). While VDI has been in existence for the past 8 years or so, it has become more relevant in the banking and insurance industries in recent years. Insurance agents and Wealth Managers work in a heavily regulated industry. While adhering to heavy regulations, the Insurance Agents and Wealth Managers have a critical need to access important information in real time to better serve their clients. Now with VDI they’re able to break free from the limitations of the traditional infrastructure, being able to access real time information any time anywhere, enabling them to focus on their clients’ needs. Join us in this session to learn from Craig Beattie from Celent and Muthu Somasundaram from VMware, how VDI has helped accelerate the pace of innovation in the Insurance and Wealth management industry, while maintaining compliance with all regulations. 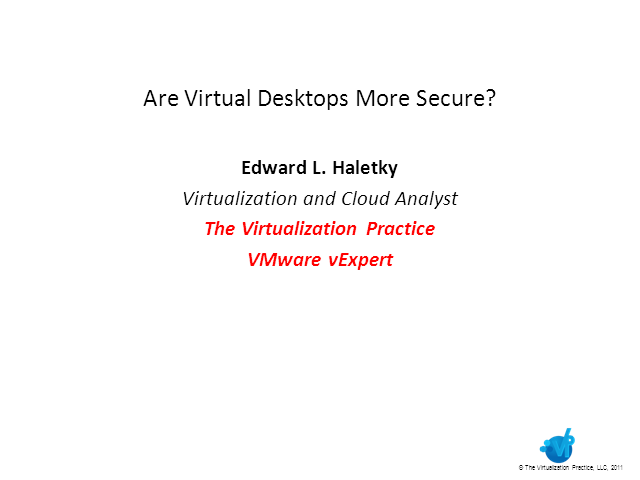 Virtual desktop infrastructure (VDI) has obvious benefits: Cost-savings, centralized management and improved security. But implementing a robust solution can be difficult and often make implementation now worth the effort if done improperly. Join former Gartner analyst Mark Margevicius as he discusses lessons learned and best practices for a practical VDI deployment so you too can see the benefits of VDI.